Four years ago I fell in love with 19th-century periodicals. It all started quite harmless when in 2010 I was invited to speak at the annual conference of the Research Society for Victorian Periodicals. 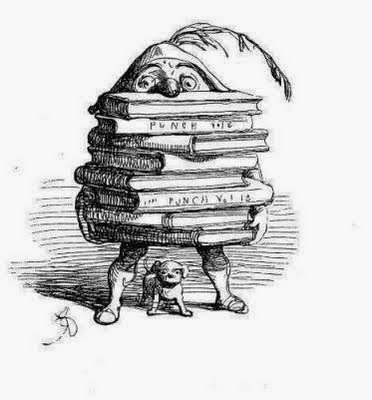 I had already done some research on the satirical magazine Punch, in particular on the artist Richard Doyle, who worked for the magazine in the 1840s. But it was at that conference that I fully grasped the sheer scope of the topic and the amazing, breath-taking wealth of information to be found in Victorian periodicals. After my return home I got lucky and found a reasonably priced collection of all Punch volumes from 1841 to 1891 online. I bought it—155 pounds of Mr. Punch! When the packages finally arrived, I was so happy that I burst into tears (which might have disconcerted the postman a little…). 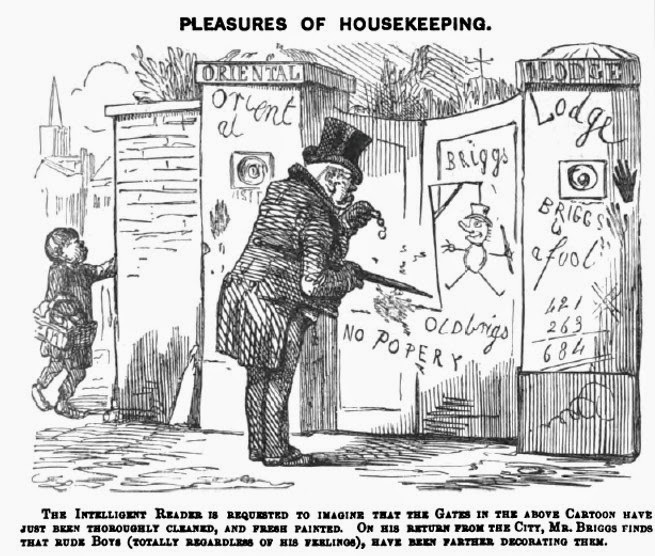 Since Mr. Punch moved into my sitting room, much of my academic research has focused on the 1840s. It was only recently that I realized I could use this research for my creative work as well. Thus, the idea for my new series about the writers and artists working for the fictional magazine Allan’s Miscellany was born. The Victorians had newspapers and magazines for almost everything: there were magazines for posh people, for poor people, for the middle classes, for the working class, for women, for men, for children, for conservatives, for socialists, for suffragettes, for garden enthusiasts, for fabric lovers (with fabric samples!) (that magazine didn’t survive for long); magazines with stories about celebrities, with poems, with serialised fiction, with sensational police reports ("Face of Burglar Eaten by Orang-utan! "), with recipes, with needlework patterns, with sheet music, with snarky book reviews, with articles about science, and what not. 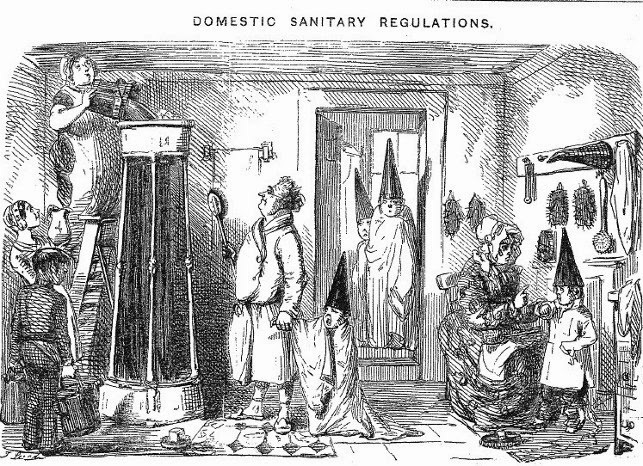 All these wonderful periodicals grant us a fascinating glimpse at everyday life in the Victorian Age. 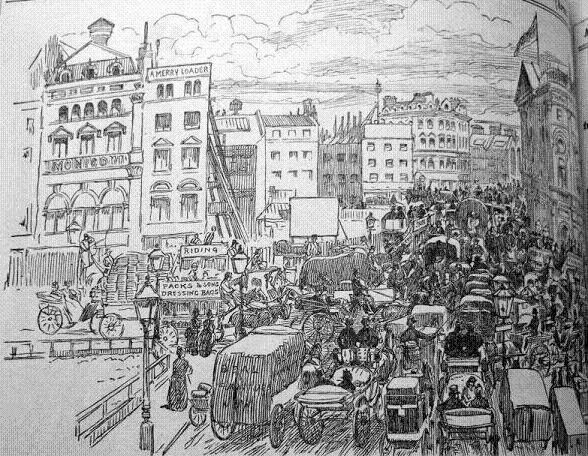 For example, who would have thought that the traffic jams in nineteenth-century London were quite as bad (if not worse!) as those in any modern city? Indeed, public transport provided material for endless jokes — ranging from the inconvenience of having to climb on top of the carriage to the perpetually late Hammersmith bus and mad drivers. ...as well as by endless house repairs. Though their showers looked a bit different than ours. Many Victorian periodicals were general magazines, often referred to as “miscellanies” because they covered a variety of different topics and contained book reviews, theatre reviews, articles on literature and science, opinion articles, and poetry. I imagined Allan's Miscellany as such a magazine. By 1846, the year A Tangled Web is set in, Allan’s has been going for seven years and has had some time to grow. The staff now comprises several writers and artists, among them comic artist Lawrence Pelham, the hero of A Tangled Web. A chance meeting with a young woman dressed in mourning changes Pel’s whole life, and without his even knowing, he is thrown into a world of mystery and intrigue, where nothing is as it seems to be—especially not the woman he has given his heart to. Thank you, Sandra, for this wonderful post! I love the illustrations that must have accompanied some pretty interesting articles! Now for the giveaway! 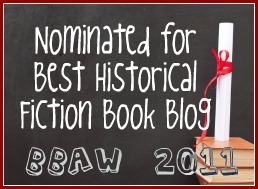 For a chance to win an eBook copy (open internationally!) 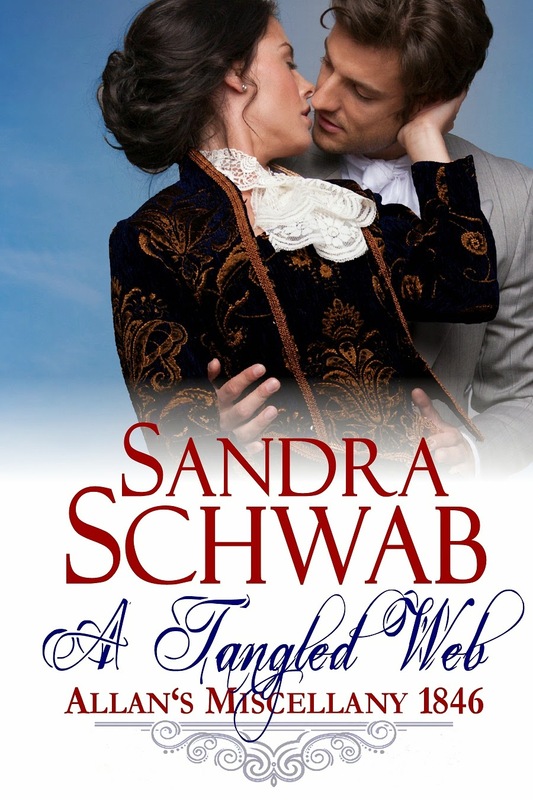 of A Tangled Web leave a comment answering the following question: if you lived in Victorian times what sort of periodical do you think you would subscribe to? Be sure to leave your email address so I can contact you if you are the winner (no email, no entry!). For an extra entry share this guest post/giveaway and leave a separate comment with a link to where you shared. That's it! I'll pick a winner on October 15th and the winner will have 48 hours to respond to my email before I pick another winner. Good luck everyone! It would have to be the Victorian version of Cosmopolitan and People. I have been lucky to find several different Victorian periodicals over the years. They are all totally different and I still search for more copies. I have 3 different volumes of Punch's magazine. They have gorgeous steel engravings. There a 2 copies of a similar periodical with engravings by Boz. I have over a dozen copies of The Illustrated London News from the late 1890's, early 1900's. They are my favourites for the jewellery ads, all the different seed pearl and diamond designs. "Swoon." Next, I have Petersen's Magazine. They are small, brown leather volumes with serial novels in them. The Raj magazine is absolutely decadent! The covers feel like silk material with gorgeous gold engraved borders, that are over an inch wide and the pictures are all in vivid colours.My Godey's Woman's magazines have beautiful hand coloured steel engravings, featuring women's fashion from the Civil War era. It's hard to find these, with all their engravings, intact in the leather bound book, since people remove them to frame.I also have 3 large black leather bound volumes of a periodical like the Englishwoman's Domestic Journal, but I think mine has a different name. I can't get to my volumes in the bookcase at the moment, but as well as the recipes, dress/needlework patterns, sheet music and the serialised fiction, they give instructions on Christmas gifts and ornaments, that you and the children make. All from around the 1870's, 1880's! How cool is that! So although I live in the present, I do collect, "subcribe" to Victorian periodicals! *waving* It's always so lovely to meet a fellow lover of Victorian periodicals! 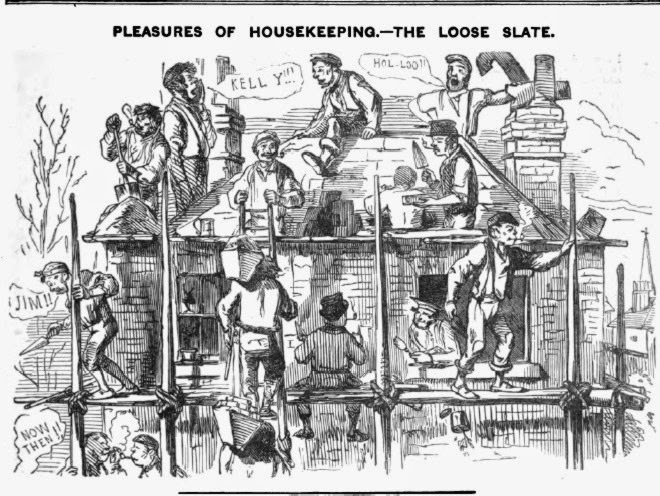 :-) The Illustrated London News is something else, isn't it? I was totally blown away when I spotted a rather tattered copy for sale on Ebay. If only the volumes weren't so very rare and so dashed expensive! I need to check out the other magazine you've mentioned. I have an early volume of the Englishwoman's Domestic Magazine, but I think I might have just picked the wrong decade or something because the copy I have is a bit bland and lacks the fantastic advice column "Cupid's Letter Bag". A local antique dealer, a few years back, had a LOT of them for sale and he wanted $5 Canadian each. I could afford about a half dozen and when I went back they were all gone, along with all his other magazines. This dealer was notorious for dumping stuff in an auction, since he wanted new stock almost every week I wish I knew where the other magazines ended up. My power bar caught on fire yesterday, right after I posted my comment. So I was out of commission for a bit. This weekend I will see if I can dig out the other periodical. $5 Canadian for a single issue? *whimpers and dies a little* I've paid way more than that. And the half-year volumes tend to be particularly expensive. F. Gilbert, Percival Skelton, R. Huttula, T.H. Wilson, W.H. Prior, W.G. Standfast, J. Palmer, etc. London: Published by John Dicks, 313, Strand, and all Booksellers. This volume starts with Wednesday, July 28, 1869. The price each week was one penny! it ends with February 1, 1870. Wow! Just found one listed on Ebay for $75 US plus $50 dollars shipping! and it is more recent than mine. Never knew these things were so expensive. My came on a container of antiques, that my parents imported from England in 1974. Thank you so much for your comments and Denise and Sandra thank you SO MUCH for the periodical suggestions....this sounds like the kind of thing I would love to hunt down and collect, although I don't think my bank account could handle it :)! Okay, now to the winner! The winner, using a random number generator, is....Denise!!! 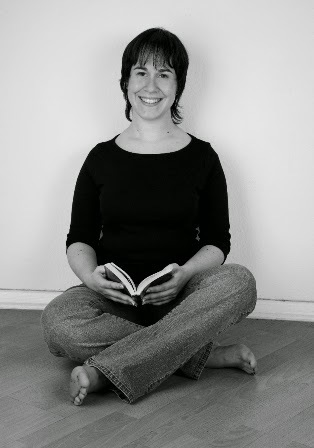 Congratulations Denise and I will send your name and email to the tour organizer so they can get the ebook out to you. I hope you love it! Thank You Colleen and Sandra. I look forward to reading this.